I am loving this gloss at the moment, using it pretty often when I step out of the apartment. 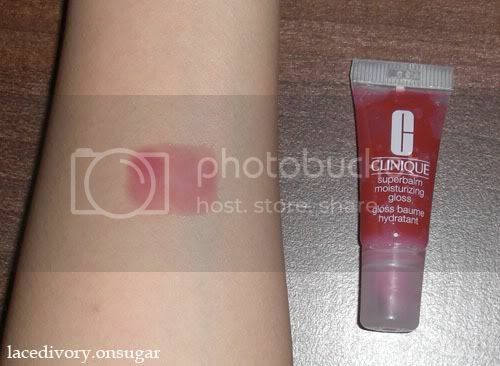 I got this in a Clinique skincare set a couple of weeks back and this is a sample-sized tube of the gloss. All pictures were taken with flash and I included two pictures of the gloss on skin just to show you how it looks when light shines on it and when it doesn’t. It’s a really nice gloss that isn’t sticky and the colour isn’t too heavy either. 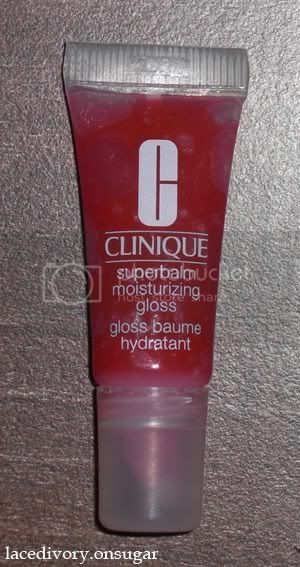 Swatch: Clinique’s Superbalm Moisturising Gloss in 02 Raspberry was last modified: February 3rd, 2011 by Roxanne C.